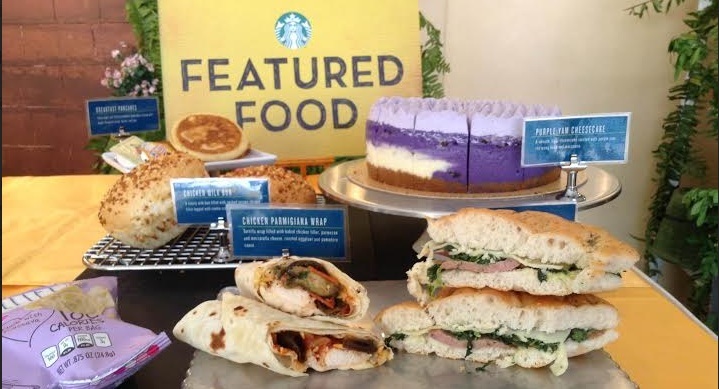 Starbucks Philippines constantly innovates its product lineup to offer exciting choices for the discriminating palates of its customers. 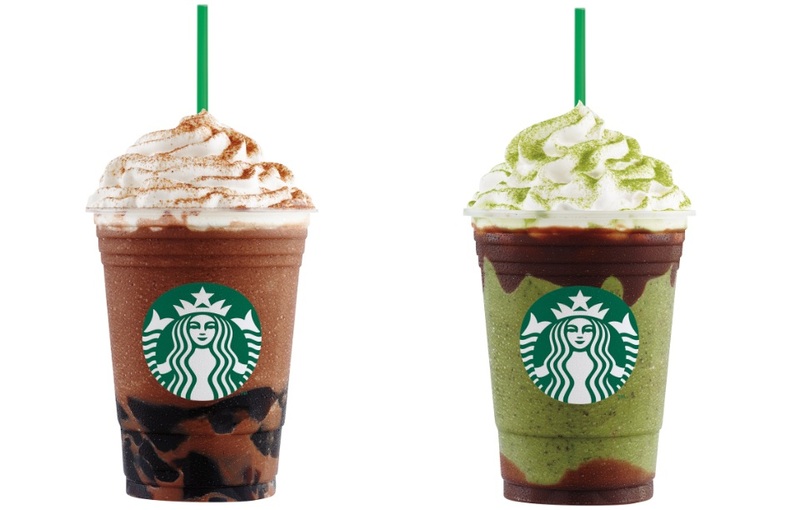 This time around, Starbucks launches two new Frappuccino Blended Beverages that combines two of the most popular food products on the whole planet: chocolate and tea . 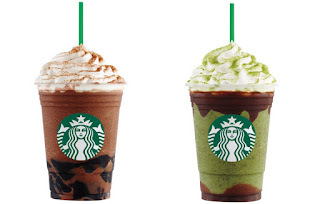 For a limited period only, (June 7 to July 25), Starbucks customers can enjoy the refreshing, unique tastes of Chocolate Black Tea with Earl Grey Jelly Frappuccino and Double Chocolate Green Tea Frappuccino. Which of the two would you like to try? Let's give you a short description of Starbucks' latest blended beverages. The Chocolate Black Tea with Earl Grey Jelly Frappuccino is a blend of Kenyan Tea leaves and chocolate infused into a smooth Black Tea Frappuccino. The layering of the beverage is simply ingenious. It starts with aromatic Earl Grey Tea Jelly, then it's topped with Black Tea Frappuccino, chocolate Java Chips, a rich amount of whipped cream and a sprinkle of chocolate Black Tea powder. The Double Chocolate Green Tea Frappuccino, on the other hand, is steeped in crunchy Java Chips with lots of smooth chocolate sauce at the top and bottom of the cup. It's topped with a generous amount of whipped cream and sprinkled with some Green Tea powder. We had a chance to taste these two new Frappuccinos at Starbucks' Summer Party at Le Reve Events Venue. You want to know our verdict about these new Frappuccinos? Well, we love both but they are very different in taste and feel. The Chocolate Black Tea is a lot stronger in taste but its blend grows on you. Like you want to have more of it as a companion for long conversations or while reading a novel. With its strong taste, it gives you a jolt that's guaranteed to wake up your senses. If you love creamy, milky taste, go for the Double Chocolate Green Tea. If you don't love green tea, don't be turned off by the name. The green tea here is blended perfectly with the chocolate, you'll hardly ever notice it. The chocolate Java chips are to die for. If you're like us, you'll probably sip to the bottom of the cup, scoop it out if you will, just to get those Java chips. You can enjoy these two new Frappuccinos for the next 7 weeks only, so try these new blended beverages soon as they come out. Meanwhile, Starbucks also launched the new Starbucks Iced Coffee Blend (P425.00), which is actually a blend of premium coffee from East Africa and Latin America . Marketing Manager Love Fernandez, demonstrated how we can conveniently brew our own iced coffee at home by just using a coffee press. He advised to double the amount of coffee to use , since you still have to mix it with ice. Would you believe that you only have to brew it for four (4) minutes to extract that citrus and a bit of caramel flavor from the coffee beans? There are also new food items that will be introduced to pair with these new beverages. These include Chicken Milk Bun, Chicken Parmigiana Wrap, Purple Yam Cheesecake, and Sausage and Spinach on Focaccia Bread. The promotion period for these featured food items will run from June 7 to July 25 too, just like the two new frappuccinos. 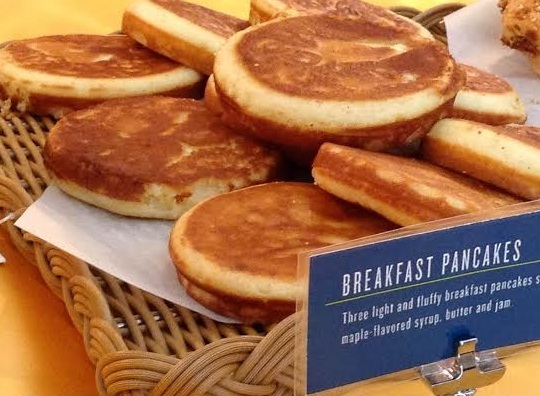 As to new core food items, Starbucks has finally come up with breakfast pancakes. The much-awaited pancakes are the yummiest ones we have tasted so far. It's thick and fluffy, and cooked perfectly, leaving no starchy taste on the mouth. For food junkies, there's Go Lite! Chips which is made with cassava and is only 100 calories per bag. You can munch on these guilt-free chips and taste how light it really is. It's not salty nor oily at all, just about perfect for snacks, minus the heavy calories.